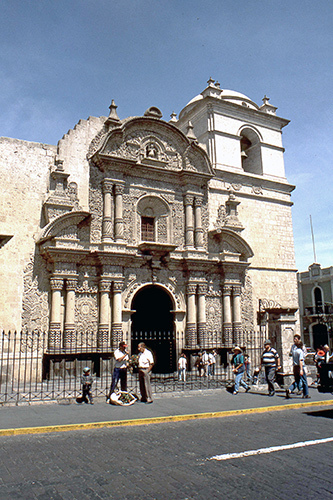 Arequipa is a city in the Southern Coastal region of Peru just below the edge of the Altiplano, at 2380 meters above sea level and surrounded by three impressive volcanoes. 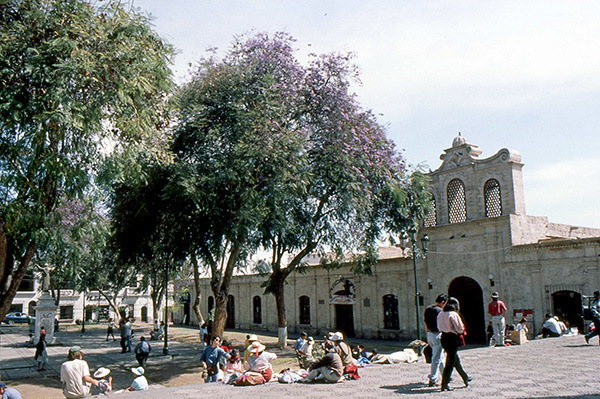 It’s Peru’s second most important city (after Lima), and the second most popular among tourists (after Cuzco). 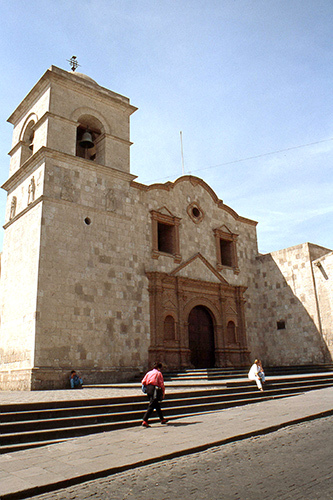 The city is part of the so called “Southern Peru Tourist Corridor”, together with Nazca, Puno and Cusco. 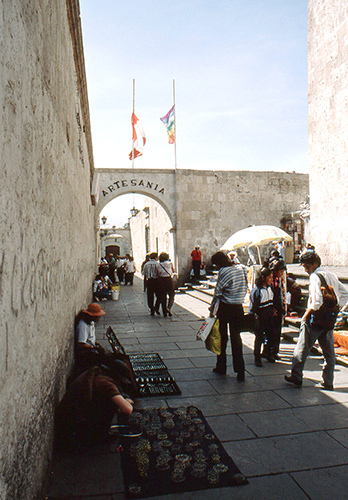 In contrast to these other cities, Arequipa is an example of the Spanish and mestizo culture developed in Peru. 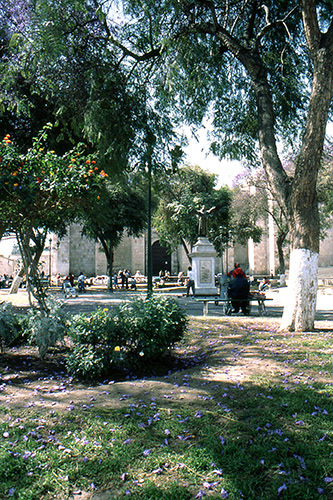 There are no Inca artifacts or ruins in the city. In the winter it is warmer than in the summer. 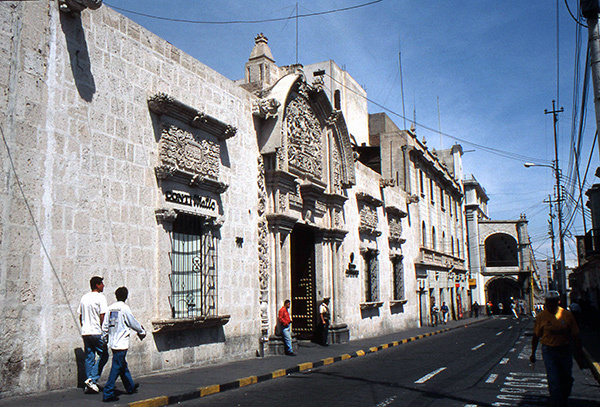 It is nicknamed the ‘white city’ (la ciudad blanca, in Spanish), because many of the buildings in the area are built of sillar, a white stone. 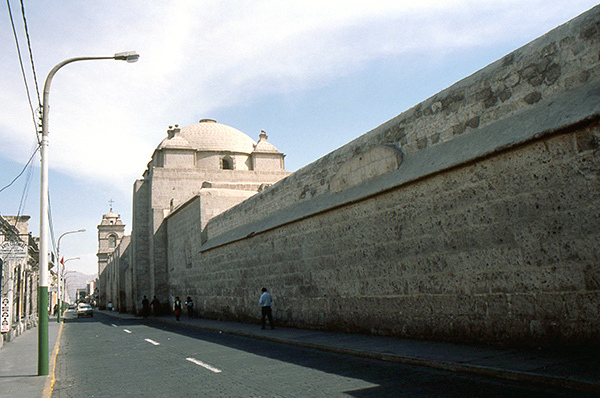 This rock was quarried from the many volcanoes that surround the city, including the towering El Misti. Ask for local help to identify Misti, Chachani and PichuPichu, the three volcanoes surrounding the city. 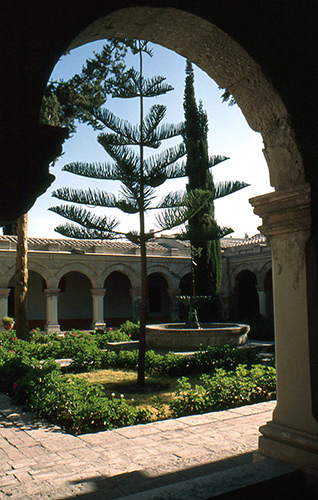 Arequipa embodies a rich mix of the indigenous and Spanish colonial cultures. 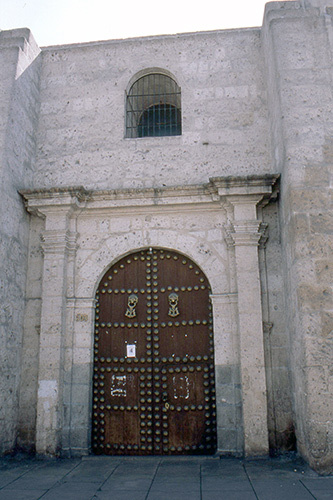 With 468 years of history since its founding, examples of Spanish colonial architecture can be found throughout the center of the city and several surrounding districts. UNESCO has declared it Human Heritage site. 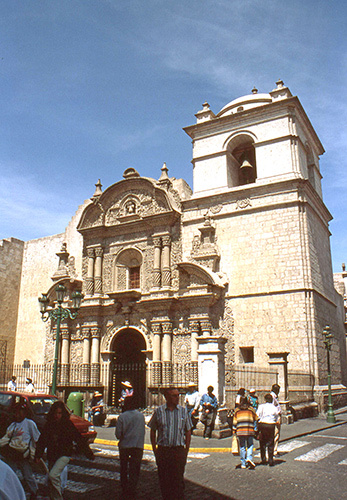 Catholic churches are scattered throughout the center of the city. 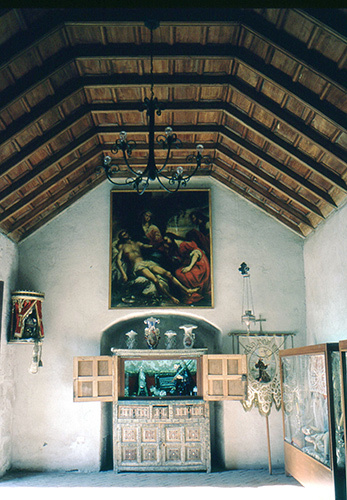 Some ancient houses have been refurbished by the local authorities and serve as living museums. 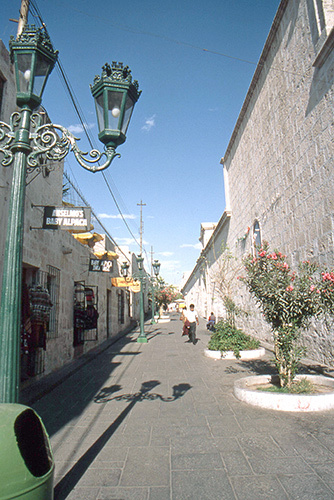 An example of this are the so-called “Tambos” located at Puente Bolognesi street. 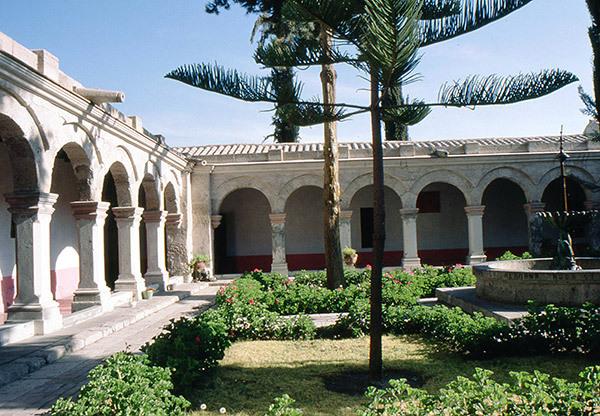 By far the easiest way to get to Arequipa is by plane, landing in Rodríguez Ballón airport (IATA: AQP), 8km from the city. LanPerú, Peruvian Airlines and Taca fly from Lima, Juliaca and Cuzco. 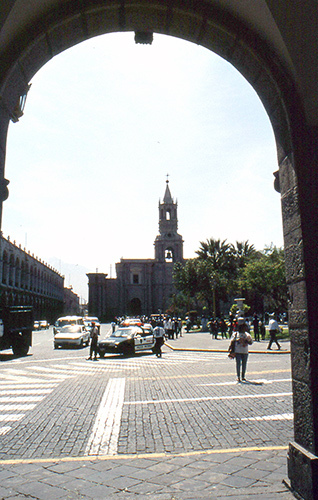 A taxi from the airport to the Plaza de Armas costs a flat-rate of S/20; go to the counter before leaving the baggage claim area to avoid hassle. Signs are posted with this rate, but depending on the size of the car, the size of your bags and your bartering skills you could pay less. No public transportation is available to/from the airport. There are two terminals serving the city, Terminal Terrestre and Terminal Terrapuerto. They’re next to each other, about 3km from the center. A taxi should cost around 10 soles (May 2014) but prices are fixed based on distance. You need a taxi to get to your hotel. Take taxis WITHIN the parking lot of the bus station. Those are registered official taxis. Express kidnappings have being reported with passengers taking taxis outside the bus stations. You can use buses/combis to get to/from the main bus terminal for 0.75 soles per person to Plaza de Armas (August 2014); much cheaper than a taxi and still quite quick. Usually Hotels do not organize pickups from bus station because buses delay and time of arrival is not exact. But you can ask your hotel to call a taxi for you when you arrive to the bus station. It will take no more than 20 minutes waiting. 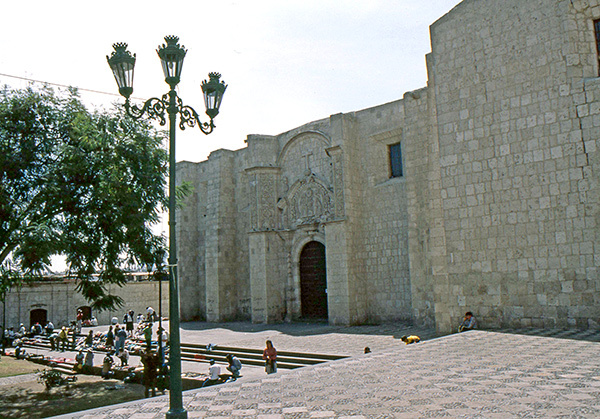 An option to go from Cusco, Lima, Paracas, Ica or Huacachina is to take one of the Peru Hop buses. This service has brand new cama buses with movies in English and Spanish their passes allow you to hop on or hop off at any of these places. Peru Hop includes hotel/hostel pick-ups and drop-offs which is pretty neat from a safety/no taxi fare viewpoint. From Lima (30-130 soles, 16-18 hours) it’s advisable to take non-stop express buses — though more expensive, they tend to be safer. 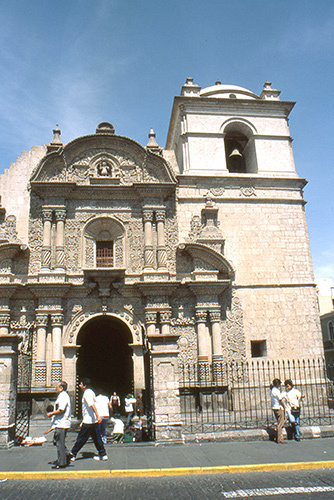 Cruz del Sur, Oltursa and Excluciva are reputable companies with special tourist services. They leave from dedicated VIP terminals in Lima. 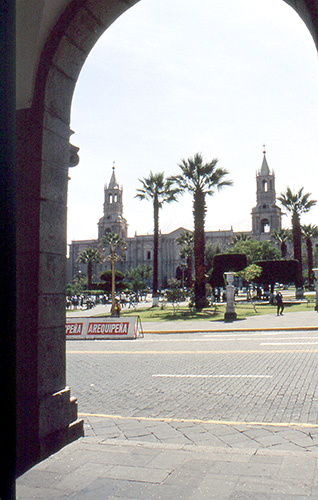 Most express buses leave starting at 5 pm in order to get to Arequipa early morning. Its a night trip and has no view attraction. 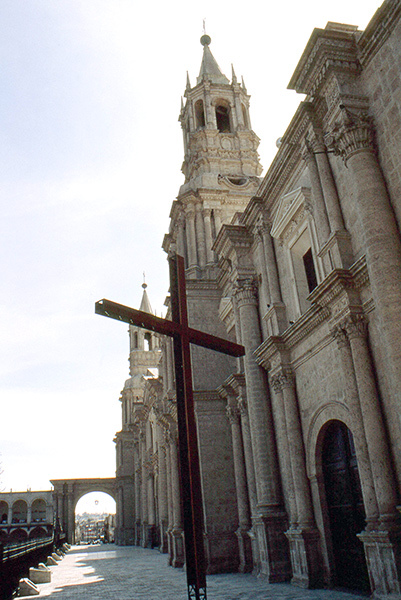 A special service from Cruz del Sur leaves at 9 pm and let you enjoy watching the beautiful coast of Arequipa during the trip. Regular or local services stop too many times on the way and your risk of loosing your luggage is very high. Avoid them. From Cusco an option is Cruz del Sur Cruzero service. Its expensive but a night non stop express service with comfortable buses. 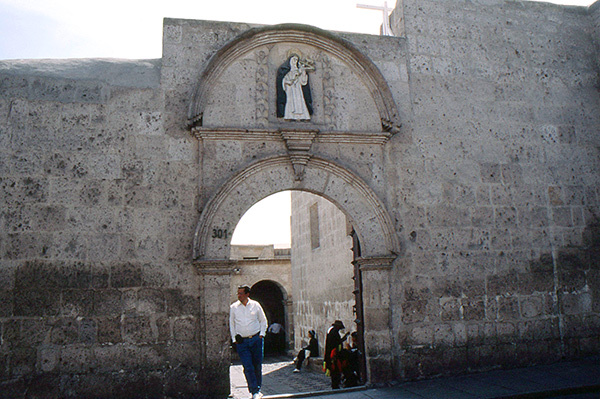 You arrive to Arequipa very early, at 6-7 am. Be aware some hotels will not give you a room that early. From Ica (12 hours). Cruz del Sur offers a night nonstop express service with comfortable seating. For Ica Andoriña bus was the cheapest (50/S. 10 hours – 5 times a day) but it stopped too many times, the AC wasn’t working and it was difficult to really sleep. 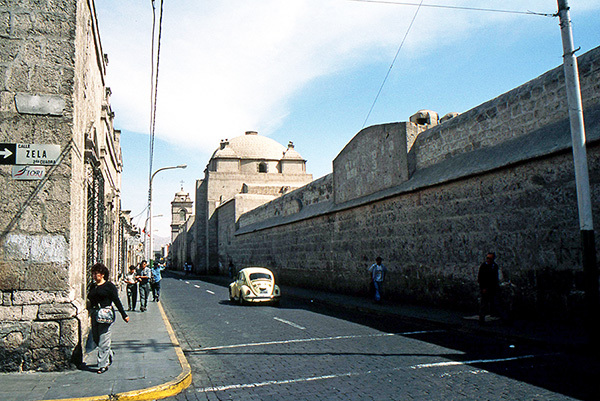 From Puno Cruz del Sur daily service leaves at 3.30 pm. Some Expresso services are also available with 4M and Giardino Tours. If you are a group (4+) you can rent a charter. All the local companies providing regular cheap service have being reported as bad and unsafe for tourists. Julsa has been reported as the worst service available. From Tacna or Chile the best option is Florez Hnos Super Dorado service leaving from Tacna National Bus Station. You better leave before night time. Its a 5 hour trip but because of customs procedures to avoid counterband the bus can be delayed 1 to 3 hours. La Paz Ormeños has direct buses leaving at 1AM every day, passing through Puno at 6AM (40 Soles) and arriving in La Paz at 12 midday (60$). 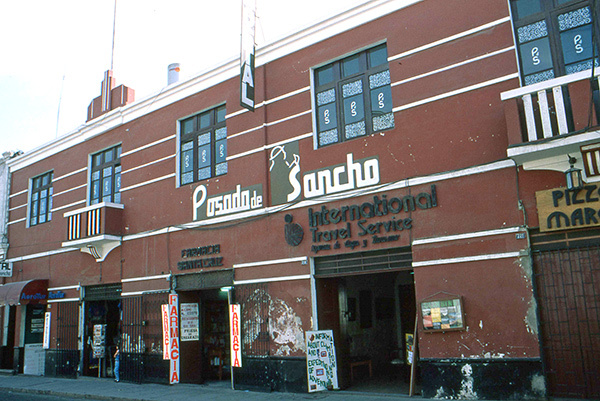 Charter trains to Juliaca and Puno are only available for groups of 40 or more.